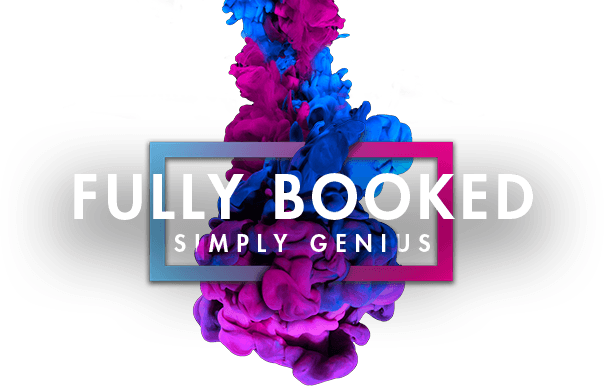 You’ve heard us talk about BookNow by SolaGenius lately – a lot. We can’t help it, we’re just really excited about it! 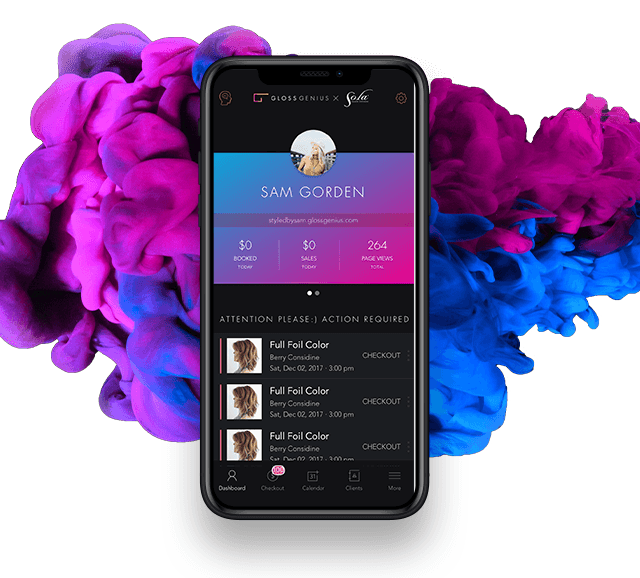 We seriously cannot wait for this game-changing feature to go LIVE so that we can start driving consumer leads to your booking pages. We have been feeling the excitement from all over, and we’ve also received some questions about what exactly this new feature will do, how to use it and how it will affect your business. So we broke it down with some helpful FAQs to get you ready to rock your online booking like a boss. What is BookNow by SolaGenius? BookNow is a brand new online search and booking engine for clients to be able to discover and book appointments with SolaGenius users, 24 hours a day. Do I have to sign up or pay extra to access BookNow? Here’s the deal: the BookNow search results will only feature Sola professionals who are using SolaGenius. If you are not using SolaGenius and want to be included in the BookNow search results, you can sign-up for SolaGenius for only $20/month (with a free trial period included!). If you are using SolaGenius you will not need to sign up for BookNow or pay any additional cost. Will my clients have to sign up for BookNow? No, BookNow is the search engine that will serve up available appointments to prospective clients. They will not need to download an app or create a username and password in order to search the database. Wait, back up…What is SolaGenius? SolaGenius is an all-in-one business solution that was created uniquely for Sola by Sola in partnership with GlossGenius to help you supercharge your business. With SolaGenius, you have access to so many amazing features–24/7 online booking, a simple calendar interface, notifications and reminders, text message and email marketing, client notes, point-of-sale, credit card processing and seriously smart analytics and reports–all in one streamlined, simple-to-use app. You can learn more about SolaGenius here. Do my clients have to sign up for SolaGenius to book an appointment with me? No, clients do not need to download an app or create a username or password in order to book an appointment with you. How will my business benefit from BookNow? BookNow by SolaGenius will help you get discovered and get booked directly on solasalons.com. New and existing clients can easily find and book your services anytime, anywhere using the BookNow online booking engine – exclusive to SolaGenius users. 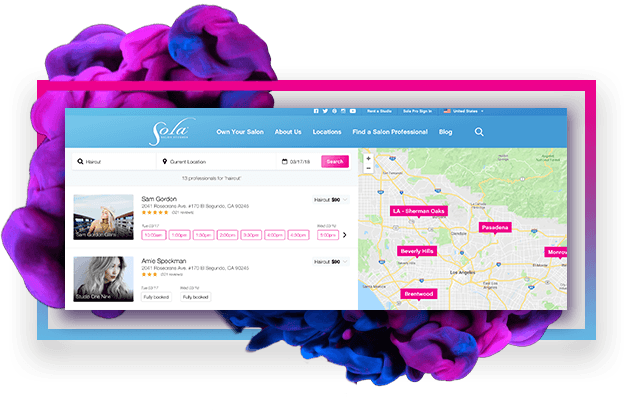 Benefit from hundreds of thousands of unique visitors to the Sola Salons website each month, and get listed in real-time search results. What’s so special about BookNow? BookNow has been specifically designed to help you get discovered by new clients and get booked quickly and easily. The BookNow search engine is front and center on the Sola homepage. That means over hundreds of thousands monthly visitors to the site have the chance to search for you 24x7 – by location, by particular beauty service, and by date. With a single, quick search, booking in a few simple clicks, and instant text confirmations, clients can easily book your services in under 2 minutes! This feature will also expand your reach and potential for business growth. Not only do you get listed on the exclusive BookNow database of beauty pros as a SolaGenius user. You also benefit all of the traffic that is currently driven to the Sola website. And as clients are able to find you more quickly and easily online, your books fill up as a result. Live the life you love without the worries of getting discovered and manually scheduling appointments. You’ll now have more freedom to pursue your passions both at work and in life. How can you prepare for new customers booking via BookNow? If you aren't already using SolaGenius, SIGN UP TODAY! Be sure to review your SolaGenius availability settings so you are always ready to work if you get bookings from new customers. Also, look at your SolaGenius website to ensure it is as up-to-date as possible. Update your photos, services, prices, etc. to make sure you are advertising accurate information and encouraging customers to book. You should also update your profile image and website image which will be featured on search results. Make sure all your services are listed with your current prices. Add a stellar gallery of your work. Customers love visuals! Make sure to block out personal time to your calendar if you want to make sure people can’t book certain time blocks.